Yes, the track meet lasted the ENTIRE day. And yes, we did all that in one weekend. That’s a pretty normal schedule for us. Actually, Olivia’s normal Sunday afternoon acting class was canceled this week so we got a break. There was once a time when I would get completely stressed out trying managing a weekend full of activities like this. Some things wouldn’t get done. I’d often feel like I was failing at life and motherhood. But once Alexandra became of age to have her own activities and interests separate from her brother and sister, I knew something had to be done. So I began to use the project management principles that were so successful at work, in my home life. Now I look forward to not only planning for our busy lives, I also love reviewing what we’ve accomplished each week. And I owe it all to these 3 must have tools that allow me to strategize, plan and manage my family with ease. Because I am a planner, I have lists and calendars for everything. My challenge was keeping them all in one place and making sure everyone in the family had access to them. With Cozi, that problem was solved. Now, all our activities are in one color-coded calendar that’s shareable with the whole family! Reminders, updates, to do lists, grocery list, and tasks are set up with the click of a button. Want to make sure your husband doesn’t forget to get the milk or your mom is reminder it’s her day to pick up the kids? Just create a profile with their name and email address and voila! Best of all IT’S COMPLETELY FREE! There is an upgraded version, Cozi Gold, (which you can try free for 14 days by clicking here), but you can do nearly everything you need without it. When I am mapping out activities for the weeks and months ahead, it’s easier to write them out before I add them into Cozi. This way I can see conflicts and overlaps ahead of time and create a backup plan. Or simply choose not to participate in something. I’m learning to embrace the polite decline. 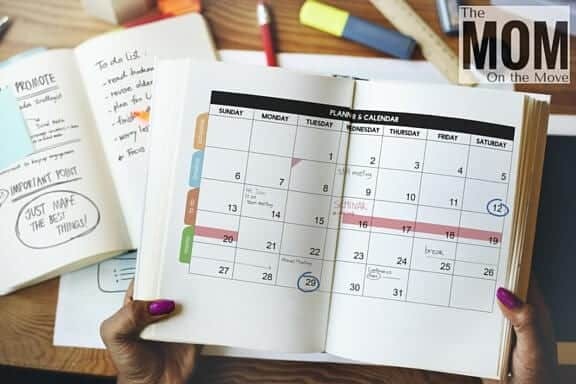 For this, I use the Mompreneur Planner, a lightweight physical planner that not only keeps your schedule but offers business planning and goal setting tools. It’s small enough to fit in your purse or bag without adding bulk, but comprehensive enough to manage your family’s busy lives. It’s especially good for those things you don’t need to share with the family – like the location your mani/pedi appointments. Even though this is last on the list, it’s actually the first thing I use in the process of managing my family’s lives. This model, by author Patrick Lencioni, is a mindset shifting tool that will help you treat your family with the respect it deserves as the primary organization in your life. Read: A Master Plan or The Master’s Plan? I learned about this tool in 2011, a life changing year for me, and I have never looked at managing my family the same again. Deciding the most important focus for your family is critical for managing the craziness of life. 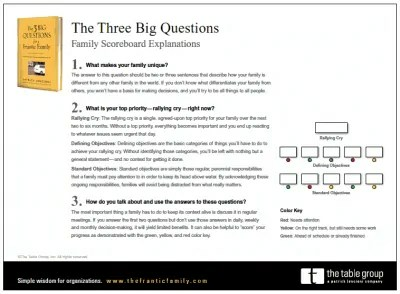 This tool provides the outline and the process for making that choice, monitoring progress toward achieving the goal and managing everything else that must be done to keep your family going. With these three must have family planning tools, the daily life in your family will go from manic to manageable in no time. Whew- I’m tired just looking at all of this. My daughter runs track so yes, those meets are a huge commitment and lasts all day long! I need to get into planners. It looks like a great way to become organized, but I think about how am I going to make the time to sit and plan and write it in a planner when I don’t have time for much. I take 1 to 1.5 hours per week and plan out all the things that have come up. I also plan out 2 to 3 months ahead of time. I don’t wait for a specific time to put things on the calendar. Then, as you use the planner you are able to add and adjust other items. It doesn’t take as much time as it seems! I am not a mom but these seem like great items for anyone with a family. Will pass along to my mommy friends. In November I started planning my family’s meals monthly. I saved so much money and felt so much more relaxed. In December, I added a cleaning schedule in the mix. I haven’t stuck to that schedule as well as the meal planning but it helps to have things in place all the same. I’m going to try the app to see if that will help keep me on track. I think you’ll love the app. Planning ahead take the stress out of so much! You definitely need to have the right tools! I’m so glad you talked about Cozi. I started using it when it first came out and there were a lot of kinks that I wasn’t willing to tryi and keep up with lol. I’ll definitely give them another shot, and look into the others. I know you know! Give Cozi another try! I love it. Wow What a busy weekend. I’ve never heard of Cozi before, but I’m definitely going to check it out. Check it out! You’ll love Cozi! My sister has 4 kids and she uses the Cozi calendar. It used to drive me crazy getting all those notifications by text message LOL. You had a busy weekend, when did you have time to breathe. LOL. I tried to use Cozi and could not get into it. I may give it a try again since I have heard great things. It’s good to see how other busy moms plan and what tools they use. Weekend’s be flying past but it’s great that u have your planning materials in order to stay on top of everything. I bet your daughter’s track schedule keep you spread thin. Planning is necessary. Yes, it does. And yes, I do. First you had a crazy busy day! But I guess that mom strength kicked in and helped you get though. I, married but no kids am still very much into being organized- so I love being able to keep a schedule. I’m going to try Cozi, I wonder if it is as effective for a single schedule. Donna it absolutely does! You can share your Cozi schedule with anyone by adding a profile to your account or just keep your own schedule, shopping list, meal plan and notes all in one place. I love Cozi! Holy smoke! You definitely need a planner. Just looking at the first paragraph did me in :-). You must have a lot of energy. I have been meaning to get a planner, l find l need it more and more :-). I don’t have that much energy, but I highly recommend Cozi. It’s an awesome tool. And its free to try. If you don’t like it, just cancel it. First, thank you Luke and Dave (and the rest of the team!) for putting so much time and effort into making the CE appear better and applicable to the ever-changing technology! As an engineer who has had a tiny taste of programming, I know it’s a ton of work! So thank you and may the Lord continue to bless your work.Second, perhaps I just missed it up there, but do y’all know about the timeframe when the newer version may be coming out that will keep track of what apps have been used and when? Un test qui dÃ©montre trÃ¨s bien la vÃ©ritÃ© suivante : Sur internet, il y a un changement brutal dont on est pas directement l’unique dÃ©clencheur? La 1Ã¨re des choses Ã faire est de ne rien faire du tout!